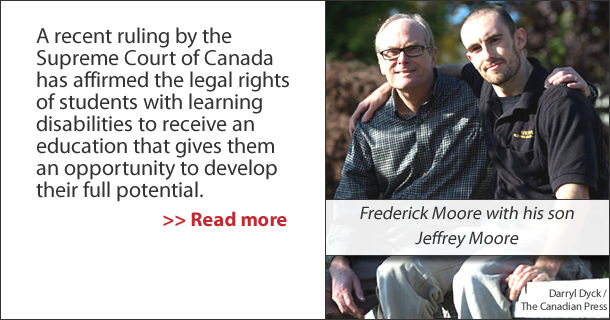 The recent ruling by the Supreme Court of Canada, in Moore v. British Columbia (Education), 2012 SCC 61 (CanLII), has affirmed the legal rights of students with learning disabilities to receive an education that gives them an opportunity to develop their full potential. The decision was unanimous. The decision has significant implications for all students in Canada with learning disabilities. The following is the story of Jeffrey Moore which led to the critical decision and a summary of some of the key factors identified by Canada’s highest court. Jeffrey Moore still could not read by the end of the third grade (1994). School assessments had identified him as having a learning disability, specifically dyslexia, and he received a combination of in-school and private supports. His learning disability was ultimately classified as severe. Recognizing his need for more intensive, individualized help, Jeffrey’s teachers referred him to a separate special program within the school district (School District No. 44 North Vancouver). However, funding cuts resulted in the program being closed. As a result, the school recommended that Jeffrey attend a private school specifically for students with learning disabilities. His parents, desperate for help, remortgaged their home and enrolled Jeffrey in that school where he made good progress. Jeffrey’s parents filed a complaint to the British Columbia Human Rights Commission, charging that the school district’s decision to close the special program and without replacing it with an appropriate alternative, denied their son the right to the type of education he required, which constituted discrimination. After months of deliberation and testimony of expert witnesses, the British Columbia Human Rights Tribunal agreed that Jeffrey had been discriminated against. Further, financial compensation for the family was awarded. However, both a reviewing judge and, subsequently, the British Columbia Court of Appeal overturned that decision. Undeterred, the Moore family appealed to the Supreme Court of Canada. A number of groups, including the Learning Disability Association of Canada attained Intervener status to be a part of the process. The Supreme Court made an articulate and powerful statement that: “…adequate special education, therefore, is not a dispensable luxury. For those with severe learning disabilities, it is the ramp that provides access to the statutory commitment to education made to all children…”. The Supreme Court of Canada validated the position long held by learning disability associations across Canada in their support for the right of all students with learning disabilities to adequate special education programs and services, including intensive evidence-based interventions for those who need them. The Learning Disabilities Association of Ontario has stated this position in its responses to Education for All and Learning for All. The Supreme Court ruling stated that, “…discrimination was made out based on the insufficiently intensive remediation provided by the District for Jeffrey’s learning disability in order for him to get access to the education he was entitled to.” According to Philpott and Fiedorowicz, the ruling means that educators have an obligation to provide individualized programs for individual needs based on appropriate assessment. The Supreme Court ruling stated that “There is no dispute that Jeffrey’s dyslexia is a disability. There is equally no question that any adverse impact he suffered is related to his disability.” According to Philpott and Fiedorowicz this language of the ruling legally secures both the diagnosis of Learning Disabilities as a disability under the law (including dyslexia) and its potential to inflict harm, if unattended. They see the ruling as supporting the position that expeditious identification and provision of individualized interventions in the most enabling environment are critical for students with learning disabilities. The Supreme Court ruling stated that “…for students with learning disabilities like Jeffrey’s, Special Education is not the service, it is the means by which those students get meaningful access to the general education…”. The court agreed with the British Columbia Human Rights Tribunal in stating that “…a range of services was necessary for these students…” According to Philpott and Fiedorowicz the ruling is a clear and unequivocal reconfirmation that a cascade or continuum of interventions for a range of needs is not a “luxury” and indeed is the standard that must be applied. This is in contrast to a common interpretation of inclusive education in which placement in the regular class is the preferred option for all students. The Supreme Court ruling stated that “Jeffrey required intensive remediation in order to have meaningful access to education”. The ruling addressed both the importance of remedial services and the equality of opportunity for individual students in order to access and master the curriculum at their individual levels. While students have equal access to a general education, in order to have meaningful access, i.e. an opportunity to achieve within that curriculum, their needs must be considered on an individual basis. Furthermore, the Supreme Court ruling states that program decisions must be based on the subjective, child-centered “individual needs” of each student and that equal treatment may be discriminatory if it violates their individual rights. The Supreme Court rejected the argument that the needs of one special needs student should be compared with the needs of other special needs students. According to Philpott and Fiedorowicz, the ruling counteracts the perspective that one placement option or one program model is best for all students, or even similar students. Regarding to the BC school district’s decision to close the special program due to budget cutbacks, without replacing it with an appropriate alternative, the Supreme Court concluded that “…cuts were disproportionably made to special needs programs…” and “… that the district did so without knowing how the needs of students like Jeffrey would be addressed…”. “Accommodation is not a question of more efficiency” and a budget cut could well result in a disproportionate and therefore unfair impact on some students. Philpott and Fiedorowicz state that school districts and school boards across the country will need to take this ruling into account when considering cutting programs for students with learning disabilities. challenges those involved in the provision of education to recalibrate both their understanding of the individualized needs of students with learning disabilities and how best to provide services that give them meaningful access to an education that maximizes their potential. challenges teachers to be increasingly diligent in their professional practice to identify and respond. challenges psychologists to be thorough and accurate in their assessments, diagnosis and recommendations for interventions. challenges decision makers to be responsible and accountable for the outcome of funding decisions. It confirms the court’s long held stand that the individual needs of students require individual planning and that a continuum of services is required. The following policy statement of the Learning Disabilities Association of Canada (LDAC) was adopted by the Board of Directors of the Learning Disabilities Association of Ontario (LDAO), as recommended by the LDAO Legislation and Policy Committee, on November 17, 2008. Learning Disabilities Association of Canada (LDAC) Policy Statement on Educational Inclusion for Students with Learning Disabilities (presented to the LDAC Executive Committee in February 2005, the LDAC Board of Directors in June 2005 and ratified on November 26, 2005). The Learning Disabilities Association of Canada (LDAC) does not support full educational inclusion or any policies that mandate the same placement, instruction, or treatment of all students with learning disabilities or the idea that all students with learning disabilities must be served only in regular education classrooms at the exclusion of all other special education placement options. LDAC believes that full inclusion, when defined this way, violates the rights of parents and students with disabilities guaranteed by the Charter of Rights and Freedom and Human Rights Codes which guarantee education equality and freedom from discrimination and rejects the arbitrary placement of all students in any one setting. 3) Focus on what is in the best interest of the student and, in that context, consider all the needs of the student as expressed by the student and his/her parents and that of their consulting professionals. Because each student with learning disabilities has unique needs, an individualized education plan and placement must be tailored on individual strengths and needs. For one student, the plan may be provided in the regular classroom yet for another student, the regular classroom may be an inappropriate placement and may need alternative instructional environments, teaching strategies, and/or materials that cannot or will not be provided within the context of the regular classroom environment. The severity and nature of the individual needs should determine the alternative teaching strategies, accommodations, resources, supports and placement required.